This never-worn (except for these pictures) vintage two-piece outfit is 100% polyester and a combination of 88% acetate and 12% nylon. It's by Impromptu and was made in the USA. The partial store tag (JC Penney) is still attached. 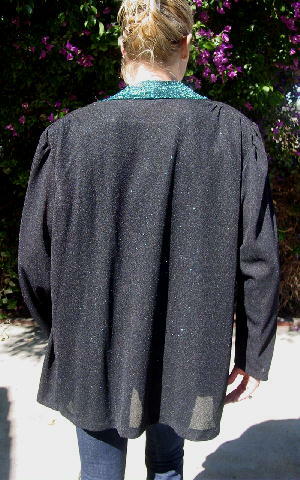 The jacket is somewhat see-through, and has 3/4 length sleeves, shoulder pads, and a black background with a metallic dark turquoise 2" wide trim around the neck and down both front sides. The see-through sleeveless blouse is 88% acetate and 12% nylon and has a jewel neckline. It fits like a size XL/XXL. She said it was originally a 3-piece outfit, but she had no idea what happened to the skirt. shoulder to hem 28 3/4"
armpit to armpit (front sides touching) 23"
shoulder to shoulder 22 3/8"
shoulder to hem 22 3/4"
armpit to armpit 23 1/8"